What is our Martial Arts Program? 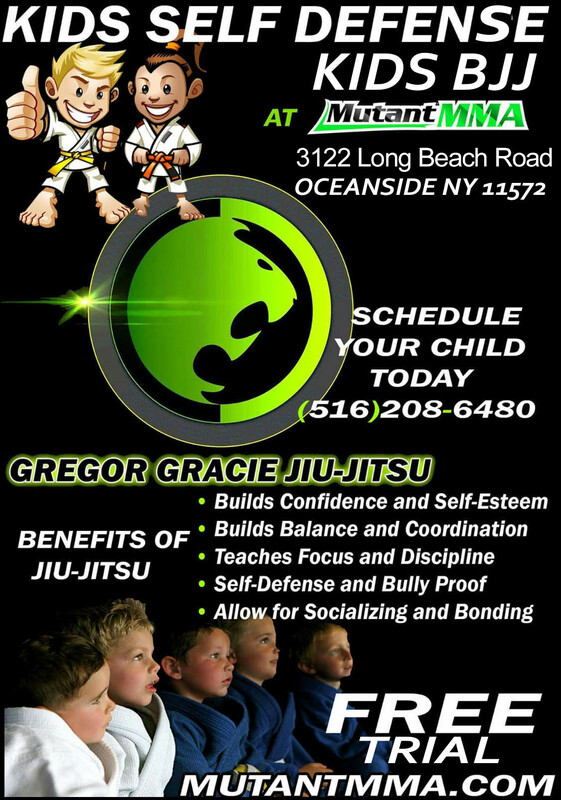 Our kids Martial Arts program in Oceanside, NY is like none other you will find around. Most gyms offer your children one style of martial arts training, but here at Mutant MMA we are teaching a multitude of styles and tequniques. Not only will they learn these tequniques in a fun and fit atmosphere, but they will also learn the importance of focus, discipline, perseverance and respect on and off the matt! At Mutant MMA we pride ourselves on the emphasis of cardiovascular and muscle endurance development for kids while having fun! What Styles of martial arts will they be learning? Wrestling- This Art form as well as Olympic sport goes as far back as ancient Roman times. The art of wrestling’s main goal is to take your opponent down and keep them there. It has been proven time and time again that wrestling is the best base for any great mixed martial artist. Jiu Jitsu- Proven to be the most effective martial art for taking out a bigger and stronger opponent, Jiu Jitsu main focus is on being more technical and smarter than your competitor. The goal of Jiu Jitsu is to make your opponent submit or TAP OUT due to a joint lock or choke without any striking involved. “There is no losing in Jiu Jitsu, either you win or you learn” – Carlos Gracie Jr.
Muy Thai- The art of 8 limbs teachers your child how to be fluid with their movements. They will be striking using their fists, feet, elbows and knees. Although the kids do NOT hit each other they will be working closely with our coaches hitting pads, working the bags and learning effective tequniques. What are the benefits of our program outside the gym? Not only will our kids program build confidence in your child’s life, but it will also help to show them the keys to success through hard work and consistency. The lessons that are learned in the gym can also be applied to in school, home and everyday life. We often like to have Mat chats with our students in which we remind them of how far they have come and how far they still have to go. But the most important lesson we teach our students is to treat other the way we would want to be treated! According to psychological sources, bullying is a specific type of aggression in which (1) the behavior is intended to harm or disturb, (2) the behavior occurs repeatedly over time, and (3) there is an imbalance of power, with a more powerful person or group attacking a less powerful one. Mostly, it is hard to define however, we all know it when we come in contact with, hear, read or see bullying taking place. Bullying can be physical or psychological, and the aggressive behavior may be verbal (eg, name-calling, threats), physical (eg, hitting), or psychological (eg, rumors, shunning/exclusion). The key elements of this definition are that multiple means can be employed by the bully or bullies, intimidation is the goal, and bullying can happen on a one-on-one or group basis. It has become extremely important, as in life or death situations to identify bullying and teach children, as well as adults just how to deal with the feelings associated with the abuse. We use martial arts to teach children to protect themselves. We teach our students to treat others as they want to be treated. In this day and age, with social media being so prominent, anti-bullying classes are used to educate and provide support for those who attend, parents as well as their children. The classes are a very positive way to empower those being bullied or teach those who are doing the bullying, just how harmful it is to everyone. We also provide learning experiences in the gym that can be applied in school and everyday life and at home. We also encourage positive motivation to parents and children to lead to a more nurturing lifestyle.